Put on your Easter Bonnet and dress your pet for the Pet Parade, led by the Easter Bunny. The parade starts at Noon time on the corner of West Martin and Queen Street and it ends at the Town Square. So if you like to have a parade for your pet, this event is worth every minute to see your pet dressed and yourself in the annual Easter Pet Parade. After the parade ends at the Town Square, there is a Easter Egg Roll on the town square for children from 1-12 years old. Fun time seeing children toss their Easter egg with a spoon across the South Lawn of the town Square. Chocolate Bunnies from DeFluri’s are awarded for the best Bonnet, Best Dressed Pet and the winners of the Easter Egg Roll. 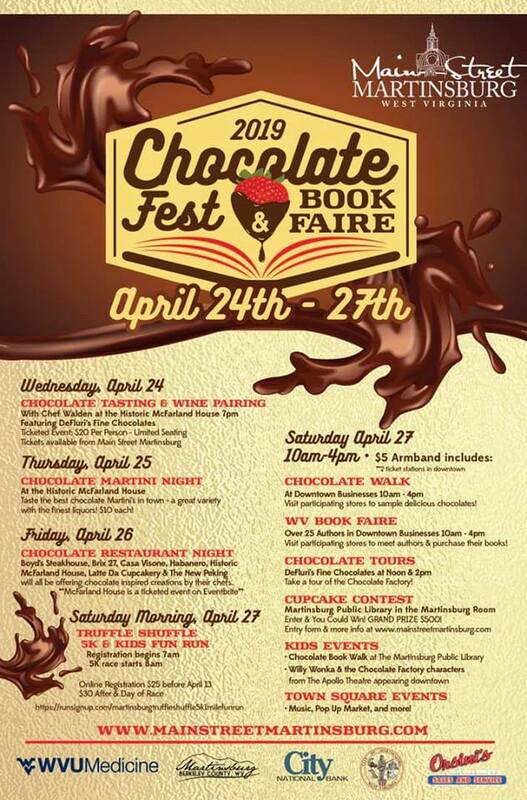 Indulge the mind and the senses at the Sixth Annual Chocolate Fest and Book Faire held in the historic downtown Martinsburg on April 26-27. Experience a chocolate extravaganza held in downtown Martinsburg… taste some wonderful chocolate, indulge yourself in an array of chocolate creations throughout the businesses in downtown Martinsburg, explore the unique shops and speak with West Virginia authors. The festival features local and out of state authors signing their books within the businesses, and participating businesses each preparing a different chocolate item for you to enjoy on the Chocolate Walk. DeFluri’s Fine Chocolates, a local chocolatier, will offer tours of its 10,000 square foot factory, plus host a wine pairing on Friday Night. An annual favorite, the cupcake competition offers a prize of $500 for the very best cupcake creation. The cupcakes are judged on flavor as well as presentation. Application deadlines for authors who want to participate in the book faire are due April 5. The Chocolate Cupcake Contest will take place Saturday, April 27 at the Martinsburg Public Library. Applications are due by April 19. More information on the event, and the applications for authors and cupcake bakers can be found at the Main Street Martinsburg website. Be sure to visit "Homes on Tour" for a look at the beautiful historic homes in Berkeley and Jefferson counties open for viewing during the 63rd Annual House and Garden Tour, hosted by the Shenandoah-Potomac Garden Council. Docents from garden clubs throughout the region guide guests through these homes and gardens, describing the architecture, furnishings and plantings, as well as genealogical information or historical events that may have taken place on the grounds or within the walls. Club members also volunteer their time and talents by providing beautiful flower arrangements to decorate the homes. Tours are scheduled at the end of April in order to capture spring's beauty at its peak. A list of the homes on tour and ticket information can be found here. The 4th Annual Great Train Raid brings the history of The Martinsburg Roundhouse and the Civil War to life with historic speakers, an authros forum, living historian displays, historical vendors, food vendors and more. Access to the event is available by parking in the Capterson Train STation parking lot at 229 E. Martin Street and walking through the overhead bridge. For those needing handicap assistance, the site is accessible however the ground is grass, dirt and gravel. Celebrate Martinsburg's rich heritage throughout the weekend with tours throughout the town's historic sites and museums. Other activities highlighting the town's historical places, events and people will also be planned. Do you know a hard-working Mom that always puts everyone and everything before herself? Let's celebrate her! Relax and giver her an afternoon off to enjoy a West Virginia wine tasting at Taylor's Farm Market in Inwood! Sip a few new wines, shop our great selection of WV foods & farmhouse gifts then have an amazingly fresh lunch or dinner at our 'talk-of-the-town' in-market restaurant Cider Press Deli & Grill! Let's celebrate Mom's of all kinds! Wine tasting is FREE. Must be 21 or over to taste and purchase alcohol. Valid ID required! Alcohol purchased at Taylor's Farm Market cannot be opened or consumed on premises including inside Taylor's Farm Market and Cider Press Deli & Grill in accordance with WV ABCA laws. The annual Irie Wine Festival is returning and will debut at a new location, the historic Martinsburg Roundhouse. The festival will feature Jamaica reggae artist Conkarah, Jah Works, and another band to be announced later. There will be over 100 wines from all over the world and more than 12 craft beers and ciders on tap. There will also be great Caribbean food from Island Bliss and various other food selections, and many art and craft vendors to choose from, as well as fun things to do for kids such as; moon bounces, mechanical bull, face painting and more! This is guaranteed to be a great time, as this year's festival at a new location; a 50,000 sq ft historical complex known as The Martinsburg Roundhouse. The Berkeley Community Chorus, under the Direction of Dr. Jeffrey Poland, shall present its 2019 Spring Concert on Saturday, May 18th at 7:30 p.m. The concert will be held at the Airborne Church located at 172 Creative Place in Martinsburg. The concert shall include a wide variety of classical/art, spirituals, folk and Broadway selections accompanied by David Asbury, Pianist or performed acapella. Tickets for the concert will be sold at the door for $10 Adult, $8 Senior, and children 12 & under free of charge. Additional information regarding the chorus and concert selections may be found at www.berkcommchorus.org. Find great local products including meat, eggs, fruits, veggies, baked goods and more. Throughout the market season, we provide lots of additional activities for folks of all ages to enjoy. You can enjoy cooking demonstrations from area chefs, go on a Healthy Berkeley Walk with a Doc, join a community garden and much more. From June 7 – August 23, you can enjoy the Main Street Martinsburg Fridays at Five concert series while you shop. The 2019 market is open every Friday, May 31 – September 27 from 4:30 – 7 p.m.
Music, BBQ, camping, workshops and more! The annual Circa Blue Fest is an amazing event packed with four days of activities. Held at the beautiful Berkeley County Fair Grounds, 2419 Golf Course Road in Martinsburg, this rain or shine event features an indoor arena with seating for 1,000 and an outdoor amphitheater surrounded by tree shaded seating. Rough camping and bath houses are on site as well. This event is family friendly. A list of bands, vendors and schedule of events can be found on Circa Blue’s website. Friday’s @ Five Summer Concert partners with the Martinsburg Farmers Market, open from 4:00 p.m. to 7:00 p.m.. To wet your appetite, here is a list of products you’ll be able to enjoy from the market this year: Fresh Fruits & Veggies, Fresh & dried Herbs, Beef, Chicken & Pork, Eggs, Jams & Jellies, Honey, Hummus, Baked Goods, Flowers, Yarn and soaps….It’s going to be a fun season. Buy local and buy Fresh. Concerts start at 5:00 p.m. and usually last until 7:00 p.m. The Town Square is blocked off between BB&T Drive-Thru and Queen Street. It is within convenient walking distance from all downtown businesses. This free family event will benefit local cat rescue organization Pat’s Little Angels. The event will feature activites for all ages include free face painting, a silent auction, music and entertainment, vendors, live music and two fashion shows for cats and people. Come dressed in your purrfect cat themed outfit ready to shake your tail on the cat-walk! Stay for the cat costume fashion show featuring the adorable cats from Pat's Little Angels Rescue. *Free Admission - Donations of cat food & supplies appreciated! Rain or shine (indoor event). Come join the festivities of the annual June Jubilee in War Memorial Park on Sunday, June 9 from 11:00 am to 5:00 pm. This event features an arts and crafts festival with displays from vendors throughout the four-state area, rides for the kids, entertainment and more. Special concessionaires offer a variety of delicious foods such as funnel cakes, Italian sausages, and homemade ice cream. Entertainment will be provided throughout the day. $5 get kids an all day pass for miniature horse rides, face-painting and moonbounces. Bring the whole family and spend a fun day in the park! If you wish to be an Arts & Crafts vendor at the June Jubilee or participate in the Car Show, please download, complete and return the applicable form to the M-BC Parks & Recreation Office in person or by mail at 273 Woodbury Avenue, Martinsburg, WV 25404. A DJ will be playing music from the 50s, 60s and 70s throughout the event, and downtown restaurants will be open for fabulous dining options. You can register your car at Main Street Martinsburg’s website. If you or your club would like more information, call Bill Largent at 304-350-1537 or email info@mainstreetmartinsburg.com. The sixth annual car meet will gather at The Martinsburg Roundhouse. This event is a car meet to honor the memory of Cory Burgess and to bring awareness to Cory’s legacy and to support the fight against Cystic Fibrosis. Bring your car, truck, van, jeep or bike any make or model will be allowed. If you can drive it or haul we will make a space for you. The event will be kid and animal friendly, but all pets but must be leashed. Experience a traditional county fair, mixing agricultural interests and exhilarating carnival elements, at the 72nd annual Berkeley County Youth Fair, in Martinsburg, August 3-10. Each day is packed with activities and events, so each day creates new experiences and memories. Fair-goers will delight in activities like bull riding, corn hole, a doughnut eating contest, tractor/truck pull, a Figure 8 Derby, a concert and more before ending the evening dashing between the dizzyingly fun carnival rides and games. Be sure to load up on delicious fair food, from grilled hamburgers to funnel cake, snow cones, cotton candy and more. Enjoy live music & good food while browsing through the unique works of hand-picked artisans. Discover a great find in wood-working, painting, jewelry, metal-work, ceramics and much more! Kids will enjoy special activities just for them. For years, Orr's Farm Market has been celebrating the coming of fall at its orchard, with a fun festival. Join Orr's for live local bluegrass, delicious food, tasty baked goods, hayrides, visit our pumpkin patch, craft vendors and children’s activities. Parking is limited so carpool is possible. Handicapped spaces will be available, first come first serve. A Pick-Up/Drop-Off Location will also be available for large purchases. Dine on a fall favorite food at Main Street Martinsburg’s annual Chili Cook-Off September 28 on the Town Square in downtown Martinsburg. As the scent of cooking chili permeates the air, enjoy a day of crafts, live music, games, beer and, of course, amazing chili. As you sample all the different chili recipes, peruse the stores and vendors in downtown Martinsburg that make the town a charming, unique area that will linger in your memory long after your visit is over. Main Street Martinsburg invites you to, “Doors to Christmas.” Twenty-five beautifully designed Christmas wreaths adorn the antique doors, decorated by local businesses. Theses wreaths will are beautifully decorated and can be used for your front door, over your fireplace or a perfect gift for someone special on your list. These wreaths will be view at the Martinsburg Public Library in downtown from Monday, November 26 to Wednesday, December 5. Enjoy this free event. A live auction of the wreaths will take place at the library on Wednesday, December 5. Doors will open at 5:30 p.m. and the auction will begin at 6:30 pm, courtesy of Edwards Auction. Acceptable payment forms include Visa/MasterCard credit cards, cash and check. Call Main Street for information: 304-262-4200. The 24th Annual Home Show brings more than 100 vendors with all areas of knowledge on home building, from getting a loan to adding that extra room to Berkeley Plaza, creating a one-stop-show for expertise and help for anyone interested in home improvement and renovation. The event is free to the public. HOURS are 10 a.m. to 7 p.m. on Saturday and 10 a.m. to 4 p.m. on Sunday. The Ultimate Wedding Expo provides a one-stop-shop for wedding needs, from music to flowers, location, food, clothing and more! Wedding professionals from the quad-state region will be in attendance to make your wedding planning experience easy and fun. Enjoy a fashion show at 3 p.m. to see all the latest styles of beautiful gowns and fashionable tuxedos. Fabulous door prizes throughout the day as well as a $500 cash giveaway and $1,000 toward a wedding dress and numerous other prizes. There is no admission fee, and the expo will be held at the Holiday Inn in Martinsburg. The 15th Annual Talent Show Extravaganza showcases the best in local talent! The Apollo Civic Theatre welcomes amateur talent of all ages and varieties from individual to groups to be part of the annual Community Talent Show Extravaganza. Prizes will be awarded to the top acts and the Grand Prize winner will be escorted and recognized in the Apple Harvest Festival Parade in October 2018!! Please direct questions to talentshow@apollocivictheatre.org. Start the new year on a fun and healthy path with the annual Frosty Family Fun Day hosted by Healthy Berkeley. This event is a fun-filled day of activities in downtown Martinsburg that can be enjoyed by the whole family. Engage in a scavenger hunt; pictures with Frosty the Snowman, snap a selfie with the Apple; delight in delicious apple doughnuts and hot cider from Orr’s Farm Market; master crafts; and so much more at this great event. Who can resist a Victorian Christmas? Travel back in time with this holiday event at the Purple Iris which will be lavishly decorated for the season. Pull traditional English Christmas crackers as you sip and savor special teas and a full afternoon tea. The Tea Lady, Judy Larkin, will get you into the proper mood to relieve the stress of the holidays and to enjoy revelry that has stood the test of time. Imagine voices singing Christmas carols and a series of hilarious Victorian games guaranteed to get the room laughing at full volume. There will also be an opportunity to do some Christmas shopping. Afternoon teas are meant to be a social event, so you may be seated at a table with other guests. This is in keeping with tea etiquette and offers you the opportunity to make new friends. (Where possible we will seat you and your guests together.) Space is limited. Make your reservations early. Come dressed in your finery as this is a special event. Period costumes are encouraged. Make checks out to “The Larkin Tea Co. LLC” and mail to 545 Warm Springs Avenue, Martinsburg, WV 25404. Reservations must be received prior to Monday, December 4, 2017. Colonial Christmas at the Adam Stephen House will again be held on the first two weekends of December which are Dec. 3 and 4 and Dec. 10 and 11 from 4 to 8 p.m. The celebration this year will have a Scottish theme (since Adam Stephen was from Scotland), and will feature decorations with Scottish tartans and bagpipe and dulcimer music. Preparations are already underway. New skits are being written for our docent actors in the house. The Association will have a Christmas Shop in the Triple Brick Museum on the weekends of the Colonial Christmas in December. Bring the kids and yourselves to enjoy the fun of an old time Christmas parade welcoming Santa's arrival before he heads back to the North Pole to make more toys! The parade begins at 6:00 and winds its way through the streets of downtown Martinsburg. Quick tip: The best place to gather is along Queen Street between King and Martin Street. Join us at the Annual South Berkeley Christmas Parade on Sunday, December 2nd at 2:30 pm in Inwood. We’ll see you at the South Berkeley Christmas Parade! Thirty-five local and regional artists bring their custom creations to Berkeley Art Council's annual Saint Nick’s Market in downtown Martinsburg. Add a personal touch to the holidays with any of the hand-crafted items at the market. Saint Nick’s Market will be open Wednesday and Thursday from 11 a.m. to 5 p.m.; Friday, 11 a.m. to 8 p.m.; Saturday, 11 a.m. to 4 p.m.; and Sunday, noon to 3 p.m.
Run your socks off for the homeless at the Keep the Faith 5K Color Run/Walk. This event will take place at Poor House Farm Park on Saturday, November 11, with proceeds from the event to benefit the Good Samaritan Free Clinic and the Faith Community Coalition for the Homeless. Registration is $30 for adults, $20 for children/students, $50 as a family rate and free for active duty and veterans with military ID. Registration begins at 10 a.m.
Gals and Ghouls, don your best costume and enjoy The Martinsburg Roundhouse's Annual Ghostly Gala at the historic - and haunted - Martinsburg Roundhouse! This charity costume ball will benefit the revitalization of the historic Roundhouse. The event will include a costume contest with cash prizes, with a top prize of $150. You'll enjoy raffles, food, beer, wine and more. The event is for those 21 and older. Tickets are available for purchase at The Martinsburg Roundhouse and Latte' Da Cupcakery for $35 Single or $60 Couple. Tickets include full buffet style dinner, dessert and two free drinks. A cash bar for beer and wine will also be available. Table Sponsorships are also available. Please call 304-707-8237 for more information. Please join us for Hedgesville's Annual Heritage Day. Festivities include vendors, food, historic presentations, handcrafted arts and crafts, a children’s area, a petting zoo, live music and more! Admission is free. The Apollo Civic Theatre brings the chills of Apolloween through the mystery and challenge of a ghoulish hunt. Search for the ghosts among the legends at the historic Apollo Civic theatre during a paranormal investigation led by the Mid-Atlantic Paranormal Investigations. Tickets are $30 and are only available online at www.apolloween.com. Ghost stories are always more scary when they're true! Learn about the ghoulish side of historic Martinsburg's past with a walking tour exploring historical properties and places, learning about their history and the local legends and ghost stories associated with them. Hear the true stories and incidents that inspired bizarre mysteries and oral urban legends that have been passed down from one generation to the next. Comfortable shoes and a flashlight are recommended. The tours are not suitable for children under 13 due to some graphic and disturbing content. All tours require reservations which must be made by calling 304-261-7470. Meeting place and other details are provided at the time of reservations.